One of the most downloaded and shared file formats is PDF. The format that was developed by Adobe in the 1990s and released as ISO 32000 in 2008, is the key format to share reports, books, and many other types of documents. It looks the same regardless of the operating system and application that it is being viewed with. The documents also cannot easily be edited. Most office suite applications have the ability to save a document or export it as a PDF. This includes Microsoft Office and LibreOffice. Both suites allow users to control the over the exportation that is more than just low or high quality. For Microsoft Office, the conversion options differ from application to application. Word’s options differ from Excel’s and PowerPoint’s. For LibreOffice’s applications, the same dialog with the same settings will appear when Export as PDF is clicked in Writer, Calc, Impress, or Draw. There is one setting that is unique to Impress. Due to the differences from Microsoft application to application, this article will compare Word’s PDF option dialog to LibreOffice’s dialog. Microsoft Office has a PDFMaker add in that enhances its PDF-making capabilities. If you purchase Acrobat Standard or Pro, you will have PDFMaker. Without PDFMaker, Microsoft Office does not have as many PDF export features as LibreOffice. This article compares the out-of-box versions. Click the Export item in the left column. Create PDF/XPS button in the third column. 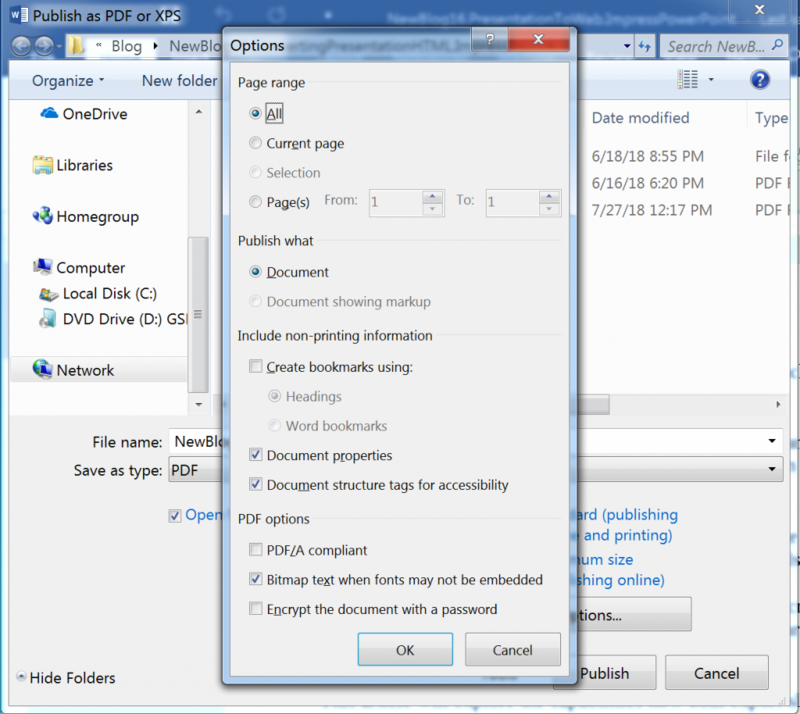 This opens the Publish as PDF or XPS dialog, where you can simply export a PDF. However, if you want more control, go to step 4. In the dialog, click the Options button. This opens the Options dialog for controlling the export. All: This means the entire document. The PDF will be the entire Word document. Current page: This means that just the page the cursor is located on will be converted to a PDF. The PDF will consist of one page. Selection: This becomes active when various text and images in the document are selected. When this radio button is selected and the OK button is clicked a PDF will be created with only what is selected. Pages: This allows you to select a certain range of pages or a select page. After selecting the Pages radio button, enter the to and from pages. This gives you the choice to publish just the document. The other choice is, if the document has been edited with mark-up, to include those markings. This allows you to create bookmarks, include Document properties, and Document structure tags for accessibility. Bookmarks can be Headings or Word bookmarks. This section gives you three checkboxes. You can make the document PDF/A compliant. Text can be made bitmap when the fonts are not available in the operating system or application are not available. You also can encrypt the document with a password. 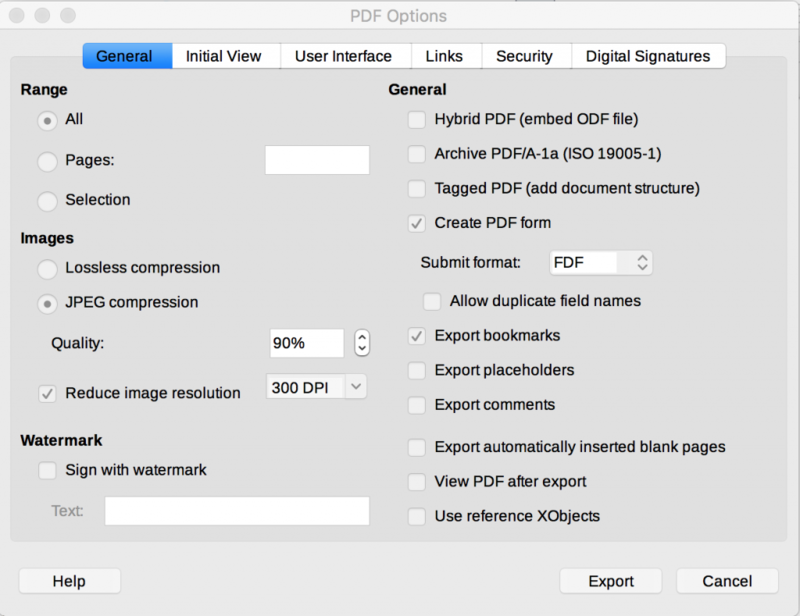 The PDF Options dialog allows you to control the export to PDF. You can also simply export a document to a PDF without going through dozens of settings. Highlight the Export As sub-menu. If you want to to simply convert the document without selecting dozens of settings, click Export Directly as PDF, then when the Save dialog appears, save the document in the desired folder. This also can be achieved by clicking the PDF icon in the Standard toolbar. However, if you want to control the conversion, click Export as PDF. 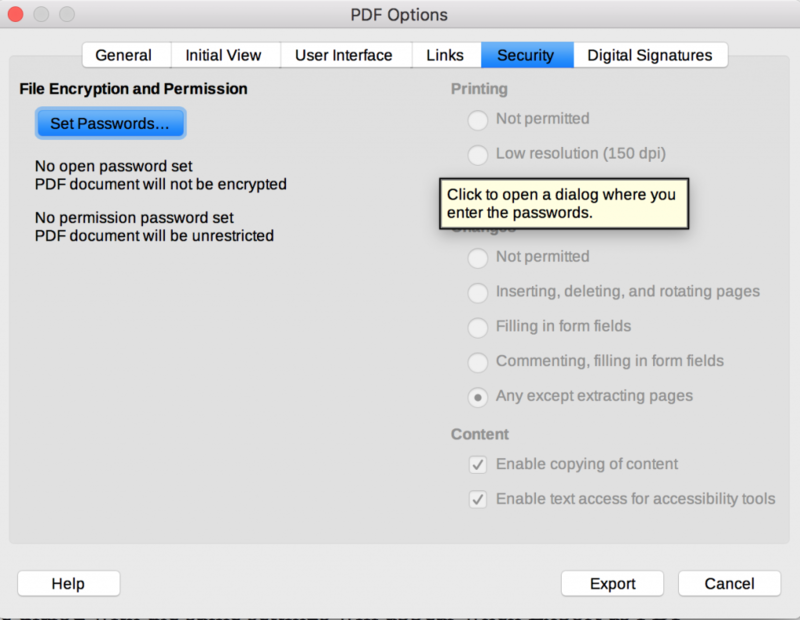 This opens the PDF Options dialog. This is like the first section for Word. It allows you to select whether an entire document, a range of pages, or a selection of text and images from a document is to be converted. If the selection radio button is chosen, then a PDF document will be created with only those items and text that have been selected. This gives you the choice between lossless compression and JPEG. If you choose JPEG, you need to set the percentage of its compression in the textbox. There is als0 a checkbox for setting the images’ resolution. The associated drop-down menu allows you to choose from five choices: 75 DPI, 150 DPI, 300 DPI, 600 DPI, and 1200 DPI. This allows you to have a text watermark in the background of the document. The text field associated with the checkbox allows yoi to type the text for it. Hybrid PDF: This type of document can be read by a PDF reader like any other PDF document. However, it contains the ODF document, so it can be edited in LibreOffice. Archive PDF/A-1a (ISO 19005-1): This is a version of PDF that is designed for archiving and long-term preservation. It does this by prohibiting features unsuitable for long-term archiving, such as font linking and encryption. Tagged PDF (add document structure): These are structured PDF documents that contain instructions for connecting the different parts of a document. The structure is expressed in tags. Allow duplicate field names: Put a check in this checkbox if your Writer document form has multiple fields with the same names. 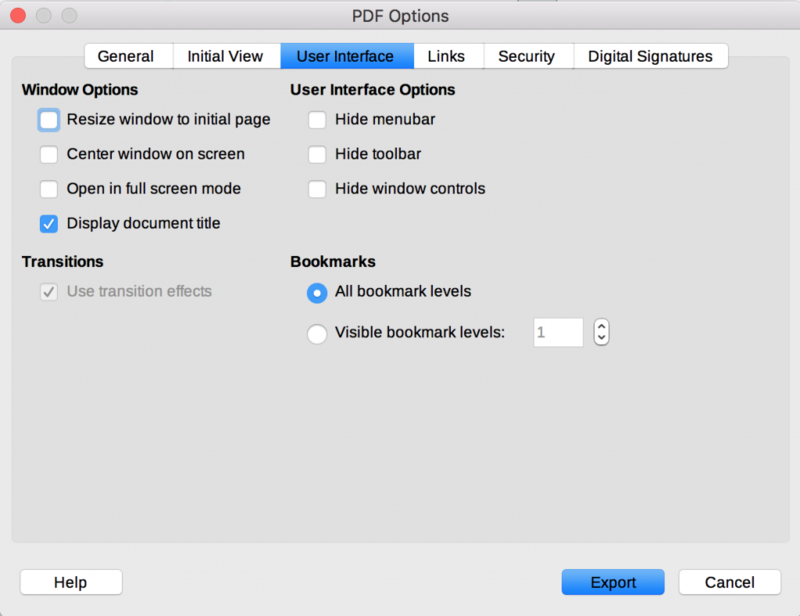 Export bookmarks: Any bookmarks in the document will become part of the PDF document. Export placeholders: A placeholder is a cue to enter something. A check in will include various the various types of placeholders. Placeholders can be inserted through the Functions tab of the Fields dialog. Export comments: This will export any comments created in your Writer document to the PDF document. Export automatically inserted blank pages: Blank pages will be inserted in the PDF document, just like they are in the Writer document. View PDF after export: The PDF document will open automatically after it is exported. Use reference XObjects: This option affects how PDF images are exported back to PDF. When this option is disabled, then the first page of the PDF data is included in the output. The PDF export merges the used images, fonts and other resources during export. This is a complex operation, but the result can be viewed in various viewers. When the option is enabled, then the reference XObject markup is used: this is a simple operation, but viewers have to support this markup to show vector images. Otherwise a fallback bitmap is shown in the viewer. The choices are Page only, Bookmarks and page, and Thumbnails and page. Page only means any bookmarks or thumbnails will be hidden when the document is first opened in a PDF reader. The Bookmarks and page choice means that bookmarks will appear with the page when the document is first opened. Thumbnail and page choice means that thumbnails of bookmarks or sections will appear along with the opening page in the document. There also is a textbox that allows you to set what page the document opens at. This let’s you set what size the document will be and how far it is zoomed into when it is opened by a PDF reader. 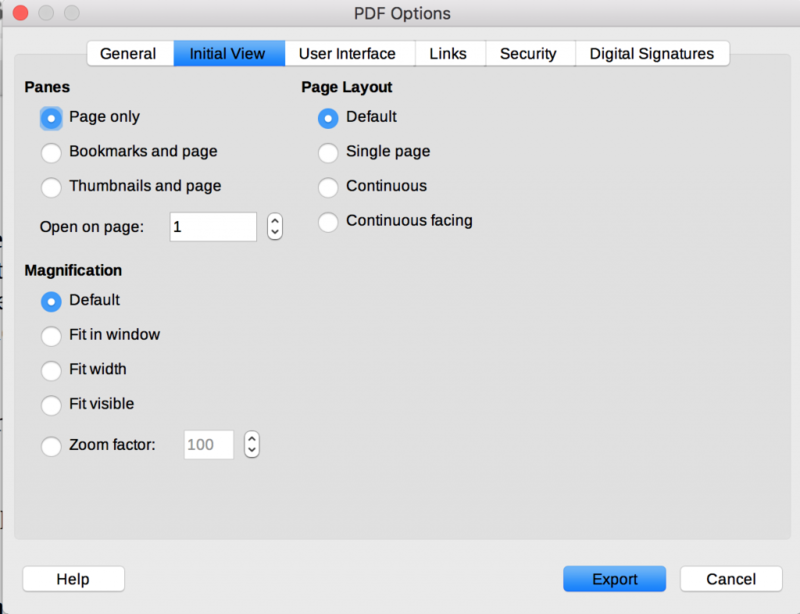 Default: Select to generate a PDF file that shows the page contents without zooming. If the reader software is configured to use a zoom factor by default, the page shows with that zoom factor. Fit in window: Select to generate a PDF file that shows the page zoomed to fit entirely into the reader’s window. Fit width: Select to generate a PDF file that shows the page zoomed to fit the width of the reader’s window. Fit visible: Select to generate a PDF file that shows the text and graphics on the page zoomed to fit the width of the reader’s window. Fit zoom factor: Select a given zoom factor when the reader opens the PDF file. Either enter the desired factor in the text box or use the up and down arrow buttons. Default: Select to generate a PDF file that shows the pages according to the layout setting of the reader software. Single page: Select to generate a PDF file that shows one page at a time. Continuous: Select to generate a PDF file that shows pages in a continuous vertical column. Continuous facing: Select to generate a PDF file that shows pages side by side in a continuous column. For more than two pages, the first page is displayed on the right. Resize window to initial page: Select to generate a PDF file that is shown in a window displaying the whole initial page. Center window on screen: Select to generate a PDF file that is shown in a reader window centered on screen. Open in full screen mode: Select to generate a PDF file that is shown in a full screen reader window in front of all other windows. Display document title: Select to generate a PDF file that is shown with the document title in the reader’s title bar. This feature only works in Impress. It will export slide transitions created in the Impress document. This allows you to choose all levels of bookmarks or the number of bookmark levels that are visible. The text box allows you to type a number 1 through 10. You also can use the up and down arrow buttons. 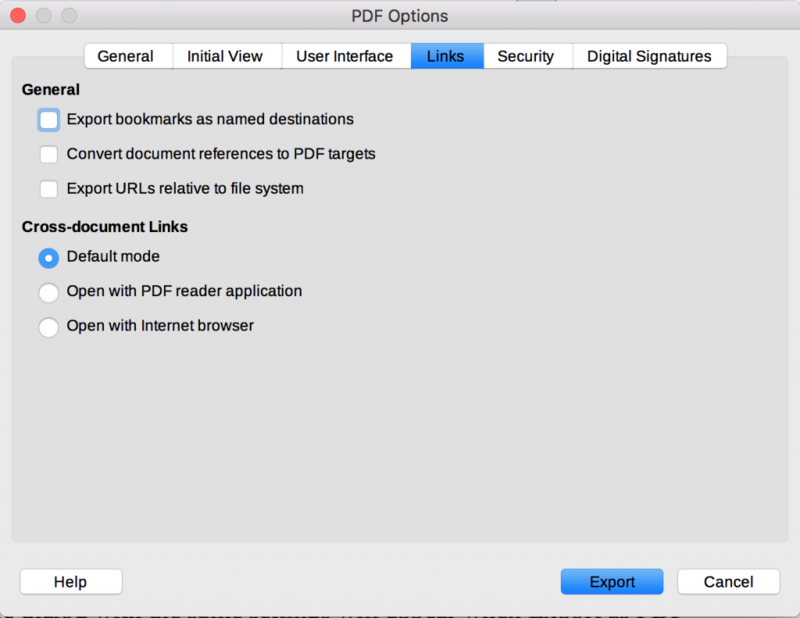 This lets you set how links in your document are exported to PDF. The two sections are General and Cross-document Links. Descriptions are from LibreOffice’s help Website. Export bookmarks as named destinations: The bookmarks (targets of references) in PDF files can be defined as rectangular areas. Additionally, bookmarks to named objects can be defined by their names. Enable the checkbox to export the names of objects in your document as valid bookmark targets. This allows you to link to those objects by name from other documents. Convert document references to PDF targets: Enable this checkbox to convert the URLs referencing other ODF files to PDF files with the same name. In the referencing URLs the extensions .odt, .odp, .ods, .odg, and .odm are converted to the extension .pdf. Export URLs relative to file systems: Enable this checkbox to export URLs to other documents as relative URLs in the file system. See “relative hyperlinks” in the Help. Default mode: Links from your PDF document to other documents will be handled as it is specified in your operating system. Open with PDF reader application: Cross-document links are opened with the PDF reader application that currently shows the document. The PDF reader application must be able to handle the specified file type inside the hyperlink. Open with Internet-browser: Cross-document links are opened with the Internet browser. The Internet browser must be able to handle the specified file type inside the hyperlink. This allows you to set a password for the document and set certain restrictions of what viewers can and cannot do. There are three choices in this section. One will be selected. This has five choices. One will be selected. 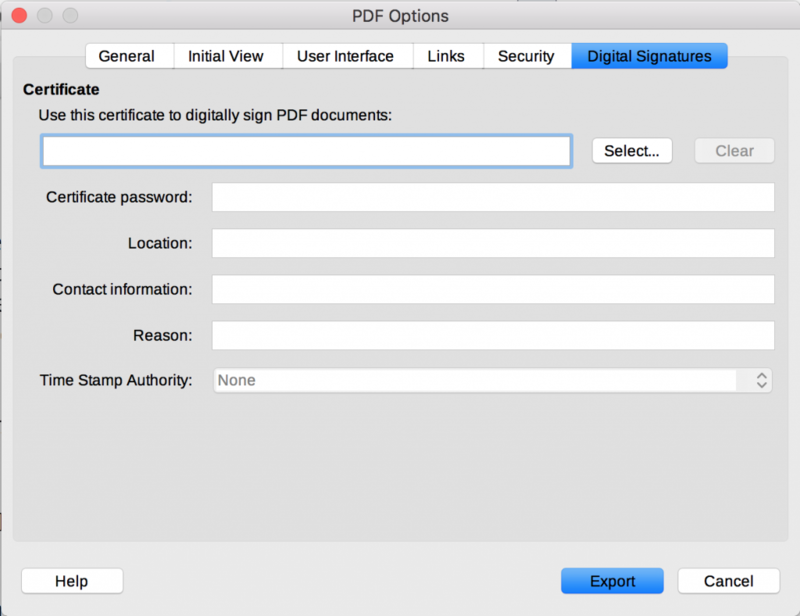 This tab contains the options related to exporting to a digitally signed PDF.Digital signatures are used to ensure that the PDF was really created by the original author (i.e. you), and that the document has not been modified since it was signed. When you are done with these settings, click the Export button. This opens an Export dialog that allows you to choose where in your computer system to export the PDF document. Both LibreOffice and Microsoft Word offer controls for converting documents to the PDF format in their out-of-box versions. LibreOffice has many more options, however. The options give the user almost total control over the export. Forms, and archival quality documents can be created. With the hybrid PDF, the document that was used to create the PDF can be sent with the PDF. This allows others to edit the document and export it to a PDF document again. These features make LibreOffice a good companion to LibreOffice. Microsoft Office users can open their documents in LibreOffice and export them to to PDF. They can can use the additional settings to control the export more.